Quantum computing's full potential may still be years away, but there are plenty of benefits to be realized right now. So argues Vern Brownell, president and CEO of D-Wave Systems, whose namesake quantum system is already in its second generation. Launched 17 years ago by a team with roots at Canada's University of British Columbia, D-Wave introduced what it called "the world's first commercially available quantum computer" back in 2010. Since then the company has doubled the number of qubits, or quantum bits, in its machines roughly every year. Today, its D-Wave 2X system boasts more than 1,000. The company doesn't disclose its full customer list, but Google, NASA and Lockheed-Martin are all on it, D-Wave says. In a recent experiment, Google reported that D-Wave's technology outperformed a conventional machine by 100 million times. 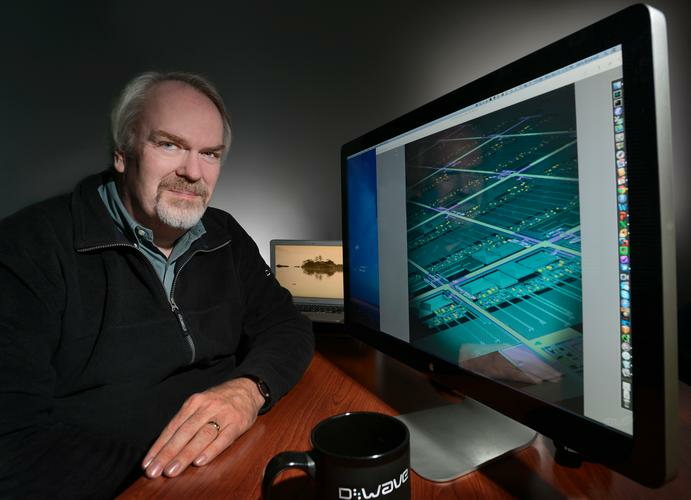 "We're at the dawn of this quantum computing age," Brownell said. "We believe we're right on the cusp of providing capabilities you can't get with classical computing." While the bits used by traditional computers represent data as 0s or 1s, qubits can simultaneously be 0 and 1 through a state known as superposition, enabling new levels of performance and efficiency. Equipped with that power, researchers can solve problems they couldn't solve before -- or so the thinking goes. "In almost every discipline you'll see these types of computers make this kind of impact," Brownell said, citing examples like drug discovery and climate modeling. "It opens up a completely new tool chest for scientists and developers." Companies can already add quantum capabilities into their existing workloads, and customers can access D-Wave's machines in British Columbia remotely. IBM recently announced its own quantum capabilities that are available via the cloud. Increasingly, cloud access will be the primary deployment model for such technologies. Quantum computing will typically be used alongside conventional systems, Brownell said. "Whether you're using an iPhone, a desktop or something else, you can access quantum technology just like any other resource," he explained. That's not to say there aren't challenges. "We manufacture the most complicated superconducting chips in the world as a side effect of trying to build these machines," Brownell said. Making those chips is no walk in the park, and neither is operating the resulting quantum systems. To achieve quantum effects, the D-Wave 2X's lattice of 1,000 qubits is cooled to 0.015 degrees Kelvin -- 180 times colder than interstellar space. The processor is shielded from almost all of Earth’s magnetic field and is kept in a vacuum, with pressure 10 billion times lower than that of the air around us. "There are lots of folks around the world doing research projects at this level, where they run for a few minutes and then write up their results, but we've had to run 24x7 for years at a time," Brownell said. "Lockheed Martin, our first customer, came on in 2010. There are a lot of challenges in combining ultralow temperatures with enterprise quality levels." Besides just quantum computing hardware, D-Wave also works on software that takes advantage of it. For instance, it's developed software that injects quantum-computing capabilities into a machine-learning training algorithm for faster training times and better accuracy. "Adding quantum computing into your classical workloads will provide an advantage," Brownell said, citing other examples including portfolio analysis, pattern recognition and optimization. In general, when a user models a problem using D-Wave's technology, the processor considers all possibilities simultaneously. Multiple solutions are returned to the user, scaled to show optimal answers. D-Wave has just a handful of reference applications that can show customers how a particular task can be accomplished, but it hopes to expand that number significantly. "People shouldn't have to understand physics at all to use these tools," Brownell said. D-Wave and IBM have gone head-to-head in the quantum space in recent years, and there's been considerable debate over whether the technologies actually live up to their claims. Further complicating things, the companies take very different approaches, making it difficult to compare them. With a focus on bringing a product to market as quickly as possible, D-Wave opted early on for a model focused on what's known as quantum annealing, in which the technology uses quantum fluctuations to solve a particular type of problem. IBM uses what's known as a "gate" or "circuit" model, Brownell said. That model is "reasonably elegant and makes a lot of sense," he said. It could also be more broadly applicable. "The gotcha is that it's super hard to do," he said. "I admire the research by IBM and others, but it's going to take at least a decade before there's a product that does anything useful." For example, the technology IBM recently offered up for public consumption features five qubits. "Will anyone ever be able to build a gate model with 10,000 qubits? That's an open question," Brownell said. "When and if that model becomes implementable, we'll have the building blocks in place and will have tackled the hard problems before anyone else." Yet another approach is known as the topological model of quantum computing, and that's the one Microsoft has taken, he said. "It's actually more elegant from a theory point of view, but it will require the discovery of new kind of particle that no physicist has ever seen before," he said. All in all, there's still much to be figured out. But while several competing approaches remain in play, ultimately all those involved are trying to move quantum computing forward, Brownell said. "We're at the bleeding edge today," he said. "It's a very exciting time to be in the middle of all this."